BE INVOLVED. HAVE YOUR SAY. HAVE YOUR SAY. DONT MISS OUT. The Forbes Community Plan 2027 will set a framework for the future of our community. It is about preparing a SHARED VISION for our community. One which will shape our preferred future taking a long-term view of planning over the next ten years. YOUR INPUT will help Council identify where we are now, where we would like to be in the future and how we can plan together to get there. It's about retaining the things Council and the residents of Forbes LOVE and ensuring we work together to create our future. We want to build on our unique features; retain the threads that make Forbes unique enhancing our lifestyle and strengthening our economy for our youth, families, aged and our business owners. Importantly it’s about looking at our future, what does it look like, what improvements can we make to enhance the region. Click on the relevant Survey icon below to start your survey! Go to our Events page to view dates and times of activities in your community. Help us prepare a vision of our future. Get involved by taking a quick survey. Click HERE to take the Survey! Come along to a Workshop being held in Forbes, Ootha, Begerabong and Wirrinya. Click HERE for dates and to register. Feel free to send an email with your thoughts. Click HERE to send an email. Get involved, take the survey and have your say. Whether you’re a resident, business owner, mum, dad, single, senior we want you to be involved. Come along and have your say in Forbes Shire future. Paint us your vision of Forbes in ten years time. Each Community Workshop will be for a duration of approximately 1.5hrs. 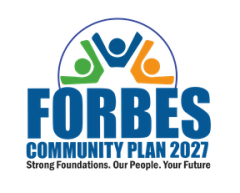 Forbes Shire Council is facilitating the development of the "Forbes Community Plan 2027" for the Forbes Shire. The Plan will provide a strategic framework to assist all stakeholders in achieving the community's vision for the future.